﻿﻿Genetic purity testing of F1 hybrid maize varieties by isoelectric focusing of seed isoenzymes. The current application relates to a more economical and superior method of determining the genetic purity of F1 hybrid varieties of maize. The method is based on preparation of a seed extract containing particular seed isoenzymes in a suitable extraction fluid and separation of the so extracted seed isoenzymes using isoelectric focusing at a suitable pH gradient formed by ampholytes, where after the so separated isoenzymes are conventionally colored and visually detected. The so obtained electrophoretic pattern is used to assess the genetic purity of maize hybrid varieties. Zea maize or maize is an agronomically very important crop in many countries of the world. Maize is used as human food, livestock feed, and as raw material in industry. The food uses of maize, in addition to human consumption of maize kernels, include both products of dry- and wet-milling industries. The principal products of maize dry milling are grits, meal and flour. The maize wet-milling industry can provide maize starch, maize syrups, and dextrose for food use. Maize oil is recovered from maize germ, which is a by-product of both dry- and wet-milling industries. Maize, including both grain and non-grain portions of the plant, is also used extensively as livestock feed, primarily for beef cattle, dairy cattle, hogs, and poultry. Industrial uses of maize include production of ethanol, maize starch in the wet-milling industry and maize flour in the dry-milling industry. The industrial applications of maize starch and flour are based on functional properties, such as viscosity, film formation, adhesive properties, and ability to suspend particles. The maize starch and flour have application in the paper and textile industries. Other industrial uses include applications in adhesives, building materials, foundry binders, laundry starches, explosives, oil-well muds, and other mining applications. Plant parts other than the grain of maize are also used in industry: for example, stalks and husks are made into paper and wallboard and cobs are used for fuel and to make charcoal. Within the past decades, F1 hybrid maize varieties have become commercially dominant over open-pollinated maize varieties. As a result of the hybridization of maize, varieties with markedly improved performance and yields, more uniform characteristics, and improved resistance to insect and disease pests have been developed. F1 hybrid varieties are produced by the hybridization of, for example, two inbred lines as parents, where the parents are homozygous. Homozygosity of an inbred line is achieved by repeated inbreeding and in general, by the sixth or seventh generation the inbred line is considered genetically pure. As a result of the crossing of the two inbred lines, hybrid vigor arises and the hybrid plants produced have improved performance, better uniformity and better insect and disease resistance than the respective parents. The increased use of F1 hybrids is also due to the inherent protection of the intellectual property. The F2 hybrid plant, originating from self-pollination or cross-pollination, and seed produced thereby, has characteristics which are less desirable than those of the F1 hybrid, for example, lower yields, and expression of undesirable genetic traits results. Due to this reduced performance, seed from F1 hybrids which produces less advantageous second generation F2 hybrids is not saved by farmers. Rather, new hybrid seed produced by crossing the originally selected inbred parents to produce the first generation F1 hybrid seed is purchased from commercial seed companies by farmers each year for their planting. The genetic purity of F1 hybrids is an essential characteristic of seed lots which is of particular importance for the seed company. Because both parents used for producing hybrids, are so homogeneous by process of self-pollination, the seed to be finally harvested also will be very homogenous of genetic composition. The final crop growing from the hybrid seed is particularly uniform as to properties like morphology, yield, harvest time, manner of culture etc. Besides uniformity, hybrid varieties also more often give a higher yield in respect of pollinated varieties. These advantages of the F1 hybrid varieties for the buyer of the hybrid seeds are of great importance (for example mechanical harvesting is made possible by the uniformity of the crop). This also shows the importance of the hybrid quality of the crop. When the mother line of the hybrid by whatever cause is self-pollinated, this leads to mother seeds instead of F1 hybrid seeds. Also self-pollination of the father line may occur and by circumstances seeds from the father can be harvested. Self-pollination of the mother line leads to inbred seeds in the hybrid seeds. This is only to a very slight degree acceptable for the buyer of the hybrid seeds. Therefore the hybrid quality of seeds in practice is determined by samples taken at random. This involves sowing a certain number of seeds, permitting the plants to grow under the right conditions to adult fruit bearing stage and subsequently carrying out a detailed analysis of all properties of the putative F1 hybrid plants. Since the hybrid is the "sum" of both parents and the parents in most cases differ in properties such analysis will yield a reliable result, but this method is time-consuming and expensive. Obtaining data relating to the hybrid quality of the seeds will be long, (some months) to expect and the seeds cannot be sold directly after harvesting. This means that the seeds in many cases have to be stored for a long time, with all the accompanying costs. This not only causes extra costs by storing per se, but also quality loss, missing sales possibilities and a more difficult planning of next productions. Protein electrophoresis presents a method by which the genetic purity can be determined much quicker than by growing plants and studying their phenotype. Protein electrophoresis is a versatile biochemical technique to detect genetic variation. Protein molecules migrate in an electric field because they are charged. When an electrical gradient is applied, the molecules migrate towards the electrode with the charge opposite to their own, with the result that the initial single boundary formed by the mixture of molecules is broken into several boundaries according to the relative mobilities of components of the mixture. This technique is useful for separating and analyzing complex proteins mixtures. Active media in which the separation occurs are agarose, starch and acrylamide. In most types of protein electrophoresis methods, the investigator can alter the porosity of the medium for more effective separation of molecules that have identical charge densities but that differ in size. In another particular method, named isoelectric focusing, proteins are separated by charge only. The electrophoresis is followed by a coloring step. Very specific methods are those used to color isoenzymes. Isoenzymes or isozymes are enzymes that differ in amino acid sequence but catalyze the same chemical reaction. The existence of isozymes permits the fine-tuning of metabolism to meet the particular needs of a given tissue or developmental stage are isoforms (closely related variants) of enzymes. In many cases, they are coded for by homologous genes that have diverged over time. Although, strictly speaking, allozymes represent enzymes from different alleles of the same gene, and isozymes represent enzymes from different genes that process or catalyze the same reaction. The two words are usually used interchangeably. Isozymes (and allozymes) are variants of the same enzyme. Unless they are identical in terms of their biochemical properties, for example their substrates and enzyme kinetics, they may be distinguished by a biochemical assay. However, such differences are usually subtle, particularly between allozymes which are often neutral variants. This subtlety is to be expected, because two enzymes that differ significantly in their function are unlikely to have been identified as isozymes. Whilst isozymes may be almost identical in function, they may differ in other ways. In particular, amino acid substitutions that change the electric charge of the enzyme (such as replacing aspartic acid with glutamic acid) are simple to identify by gel electrophoresis, and this forms the basis for the use of isozymes as molecular markers used in the determination of genetic purity. To identify isozymes, a crude protein extract is made by grinding or extracting plant tissue with an extraction fluid which is in all cases water, but containing different kinds of appropriate chemicals. Thereafter the components of extract (the proteins) are separated according to their charge by gel electrophoresis. All the soluble proteins from the tissue are present in the gel, so that individual enzymes must be identified using an assay that links their function to a staining reaction. For example, detection can be based on the localized precipitation of soluble indicator dyes such as tetrazolium salts which become insoluble when they are reduced by cofactors such as NAD or NADP, which generated in zones of enzyme activity. This assay method requires that the enzymes are still functional after separation (native gel electrophoresis), and provides the greatest challenge to using isozymes as a laboratory technique. The so obtained gel pattern or banding pattern or zymogram can then be analyzed for genetic variability. A good analysis expects interpretation of gel patterns. The resulting banding pattern is an electrophoretic phenotype, which usually consists of one or more colored bands for each individual. In some cases, it may be simple and consist of a single invariant band in the whole sample. In contrast, some enzymes may display complex phenotypes with 15 or more bands per individual. Thus, a correct interpretation of banding patterns in genetic terms requires the proper determination of the pertinent factors that influence the electrophoretic phenotype. Moreover, e.g. null alleles, intergenic heteromultimers, multiple-banded products ("shadows") and artifacts may act. An explanation of gel patterns in genetic terms may mean assessing at least the mean number of alleles per locus, the percentage of polymorphic loci, the mean number of alleles per locus and effective number of alleles per locus. Genetic purity testing of crops by electrophoresis found widespread occurrence in the seed industry since the time needed to analyze the genetic purity of commercial seed decreased dramatically in many cases. With the use of isoenzymes in the assessment of the genetic quality of F1 hybrid seed one has the possibility to distinguish between inbreds (being self-pollinations of the female) and other crossings. Thus one may speak of hybrid purity and varietal purity. Hybrid purity means purity with respect to the percentage of inbreds occurring in a certain seed lot. Varietal purity means trueness to type. The distinction is important since in many cases one may be interested mainly in hybrid purity for example in those cases where out-crossing is ruled out. Starch gel electrophoresis is the first protein electrophoresis technique that was developed for analyzing the genetic purity of maize. Several starch gel electrophoretic procedures have been developed in the lastl 2-3 decades of the past century. These procedures are based on growing 6-8 day old seedlings, taking samples of the seedlings, pressing some juice or making homogenates and perform starch gel electrophoresis followed by enzyme staining. Starch gel electrophoresis has evolved as the method of choice for many seed companies a as well as for companies that deliver services in the field of genetic purity testing of commercial F1 hybrids of maize and other commercial crops. Particularly the many genetic studies done in the US during the end of the past century formed the basis of the genetic purity testing methods of maize (M. M. Goodman, C.W. Stuber, C.-N. Lee, F.M. Johnson Genetics 94: 153-168, 1980;K I. Newton and D. Schwartz. Genetics 95: 425-442, 1980). Isoelectric focusing of maize seed protein is an alternative to the described starch gel method that evolved several years late. 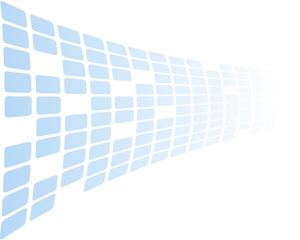 IEF is a technique for separating different molecules by their electric charge differences. It is a type of zone electrophoresis, usually performed in a polyacrylamide gel, that takes advantage of the fact that a molecule's charge changes with the pH of its surroundings. A protein that is in a pH region below its isoelectric point (pI) will be positively charged and so will migrate towards the cathode. As it migrates through a gradient of increasing pH, however, the protein's overall charge will decrease until the protein reaches the pH region that corresponds to its pI. At this point it has no net charge and so migration ceases (as there is no electrical attraction towards either electrode). As a result, the proteins become focused into sharp stationary bands with each protein positioned at a point in the pH gradient corresponding to its pI. The technique is capable of extremely high resolution with proteins differing by a single charge being fractionated into separate bands. Isoelectric focusing of proteins derived from seeds, including maize seeds, is widely applied and recognized in the art as a robust method for separating proteins. The method is particularly suited for the study of seed proteins such as the proteins from maize seed kernels. Many studies have been published on detection of maize seed proteins using isoelectric focusing. The first study was by P.G. Righetti, E. Gianazza, A. Viotti, and C. Soave on the heterogeneity of storage proteins in maize (Planta 136, 115-123 (1977)). Many dozens of publications on this subject appeared thereafter. Through these developments, the use of the method has been adopted by the International Seed Testing Agency (ISTA. Zürichstrasse 50, 8303 Bassersdorf. Switzerland). Further, the method is now used already for many years by many seed companies as well as companies that deliver genetic services in the field of genetic purity testing of commercial F1 hybrids of maize. The method was reviewed by R. Cooke (J of Chromatography 698, 1995, 281-299). Currently, as described above, starch gel electrophoresis of seedling tissue and isoelectric focusing of seed protein followed by general protein staining using Coomassie Brilliant Blue stain are widely used protein electrophoresis methods by which the genetic purity of maize seeds is determined. Both methods have advantages and disadvantages. With respect to ease and reliability of interpretation of the colored protein bands, the starch gel electrophoresis method is favored. The isoenzymes bands as seen on starch gels are much easier to interpret, but more importantly, the genetic characterization of the isoenzyme bands has been done in extensive studies by several groups of investigators during the last decades of the past century. In contrast, the Coomassie colored seed protein bands obtained by isoelectric focusing are not easy to interpret due to the many number of bands, whereas the genetic basis of most bands is unclear, or only under highly reproducible conditions. This makes the method much less reliable since artifacts cannot be ruled out because of the lack of genetic interpretation of the banding pattern. A disadvantage of the starch gel electrophoresis method is the cumbersome preparation of the starch gel. Furthermore the reproducibility of the starch gel leaves much to be desired since the quality of the starting starch is not constant. Moreover, introduction of the method in a laboratory that wants to start with the method is hindered by the fact that no standard commercial equipment is available to apply the method on a large scale in a routine laboratory on a daily basis. In contrast, isoelectric focusing is a highly standardized method with standardized gels that are commercially available, and equipment that are used worldwide. A distinct advantage of isoelectric focusing over starch gel electrophoresis is the extreme resolving power of isoelectric focusing. Where starch gel electrophoresis results in protein bands of many mm's thickness, the bands gained with isoelectric focusing are mostly fractions of a mm thick. An important advantage of isoelectric focusing of seed protein is the speed of analysis. The use of seed as object of analysis - as opposed to seedling tissue - makes the method more rapid compared to the use of starch gel electrophoresis that is based on seedling analysis. This particular advantage of speed of analysis has in many cases led to replacement of the starch gel electrophoresis method by isoelectric focusing. This illustrates the importance of the timely analysis of the seed after harvest. Another advantage of isoelectric focusing is that the gel used is prepared in a simple manner from polyacrylamide. Further, gels are also commercially available. Such a gel is well reproducible and may be kept in a refrigerator for a long time in contrast to the starch gels. A major advantage of starch gel electrophoresis is the possibility to use the genetic data on isoenzyme variability in the process of registration of new varieties. The International Union for the Protection of Varieties (UPOV) has added a list of electrophoretic characteristics and a description of the method to be used to the registration process. UPOV decided to place these characteristics in an Annex to the Test Guidelines, thereby creating a special category of characteristics. These characteristics can however only be used as a complement to other differences in morphological or physiological characteristics. UPOV reconfirms that these characteristics are considered useful but that they might not be sufficient on their own to establish distinctness. For the analysis of enzymes, starch gel electrophoresis is recommended. Genetic variation of enzymes (i.e. 16 enzyme loci) can be detected. These enzymes primarily are malate dehydrogenase (MDH), alcohol dehydrogenase (ADH) with isocitrate dehydrogenase, phosphor gluconic acid dehydrogenase, phosphoglucomutase, phosphoglucose isomerase, diaphorase and acid phosphatase also playing an important role. Genetic control is known for each enzyme locus. For the description of the method and the genetic interpretation of the zymograms, reference is made to the technical bulletin by Stuber, Wendel, Goodman and Smith, Biochemical Genetics 26, 421-445, 1988, and the technical handbook by Grenèche and Giraud (Bourgoin-Greneche, M., and Giraud, G., 1994: Technical reference manual for the isoenzymatic analysis of maize. Presentation of the method for scoring the gels and interpretation of the zymogrammes. Ed. GEVES, Guyancourt). The alleles are described by band numbers according to the definition given by Cardy, Stuber, Goodman, 1980. See also Cardy, B.J., and Kanneberg, L.W., 1982: Allozymic variability among maize inbred lines and hybrids: applications for cultivar identification, Crop Sci., 22, 1016-1020. The current application has elegantly combined the advantages of both systems as described above in a single electrophoretic method by having developed improved methods of seed extraction and protein separation. The embodiment of the current application use seed as the source of enzymes as to obtain a highly rapid method for testing the genetic purity (hybrid purity as well as varietal) maize F1 hybrids (as opposed to using seedling tissue), and to separate the proteins from the crude seed homogenate using isoelectric focusing, followed by coloring for isoenzymes. Fig. 1 represents an isoelectric focusing pattern for malate dehydrogenase (MDH) with samples of 3 different seed lots, namely a seed lot of a F1 hybrid, and a seed lot of both parents of the F1 hybrid. The figure shows the genetic variation of the malate dehydrogenase and the genetic difference between the parents of the hybrid. Figure 1. Isoelectric focusing pattern of malate dehydrogenase from maize seed kernels. For all 3 seed lots 4 seeds were analyzed. All hybrid seeds should have the same banding pattern. If one finds a banding pattern similar to that of the female, then one assumes that this represents inbreeding. In this way one can easily determine inbreeding by visually inspection of the banding pattern and evaluate the genetic purity of the seed sample subjected to isoelectric focusing of the seed protein and draw conclusions on the genetic purity of the seed lot from which the seeds have been taken. Fig 2 represents an isoelectric focusing pattern for malate dehydrogenase of an F1 hybrid variety whereby 49 individual seed were analyzed. 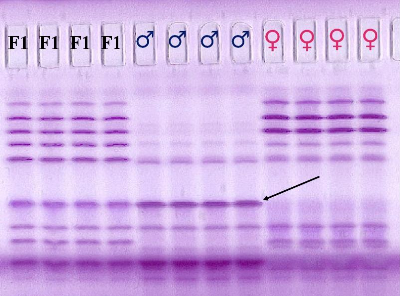 At the right side of the figure - the final three samples - the female male and hybrid are incorporated into the analysis as to serve as reference. Visual inspection shows 7 banding patterns (indicated in the figure with arrows) that indicate inbreeding. However, one of these - the one indicated with the arrow at the most left side - also shows an additional band that is not present in either one of the parents. Figure 2. Isoelectric focusing pattern of malate dehydrogenase from maize seed kernels. This particular seed can be named as an off-type, being an individual not having the phenotype of a female, nor of a male nor of a hybrid. Presumably the female was pollinated with pollen coming from another plant than a female or a male of the F1. In accordance with the embodiment of the present application, we have found that the present method of determining the genetic purity of seed samples of maize F1 hybrid varieties based on preparation of a seed extract containing particular seed isoenzymes in a suitable extraction fluid and, separation of the so extracted seed isoenzymes from each other by means of isoelectric focusing presents a more economical and superior method compared to the current methods such as starch gel electrophoresis and isoelectric focusing of seed storage protein. The application refers to agriculture, namely to a method of determining the genetic purity of seed samples of maize F1 hybrid varieties. The proposed method of determining the genetic purity of the maize F1 varieties includes preparation of a seed extract containing particular seed isoenzymes in a suitable extraction fluid, separation of the so extracted seed isoenzymes from each other by means of isoelectric focusing at a suitable pH gradient formed by SinuLyte carrier ampholytes, whereafter the so separated isoenzymes are conventionally colored and visually detected. According to the present application the genetic purity of F1 hybrid seeds of maize is determined by using the difference between the isoelectric points of particular mother and father specific isoenzymes. The present method is particularly suitable for the rapid determination of the genetic purity of commercial F1 maize varieties.